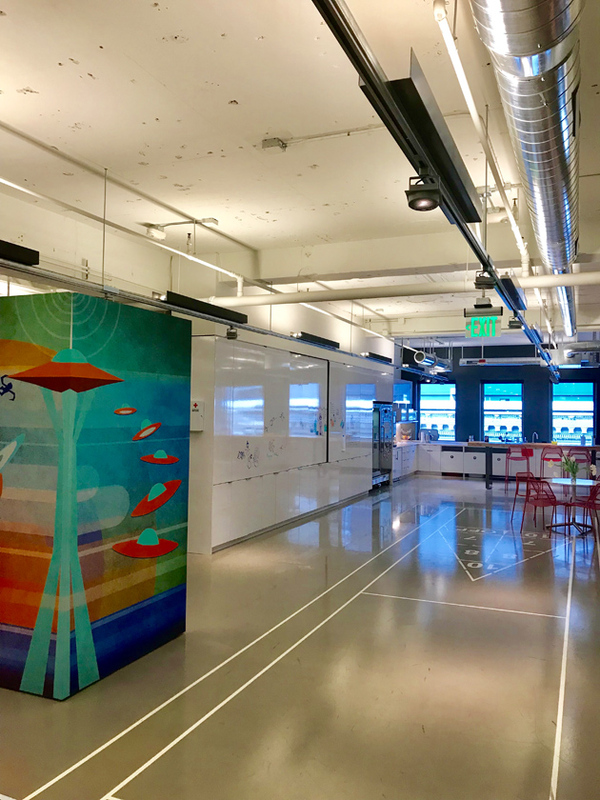 Seattle tech companies are redefining their workspaces with fabulous artwork. When we think of technology, our first thought may not be art. But the root of the word technology starts from the Greek origin “techne” meaning “art skill, craft and cunning of hand,” so technically tech is a form of art. Seattle is a city driven by imagination and creativity; it’s natural that artists and technology entrepreneurs thrive here. 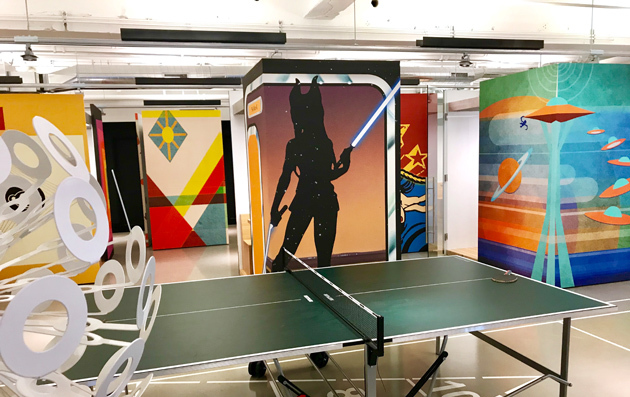 These five companies bring their workplace walls alive, injecting visual vibrance into the environments and empowering employees to draw inspiration from the creativity. A brilliant art collection can reflect a company’s history and demonstrate its character, style and spirit. Coffee may be the first thing that comes to mind when you think of Starbucks. 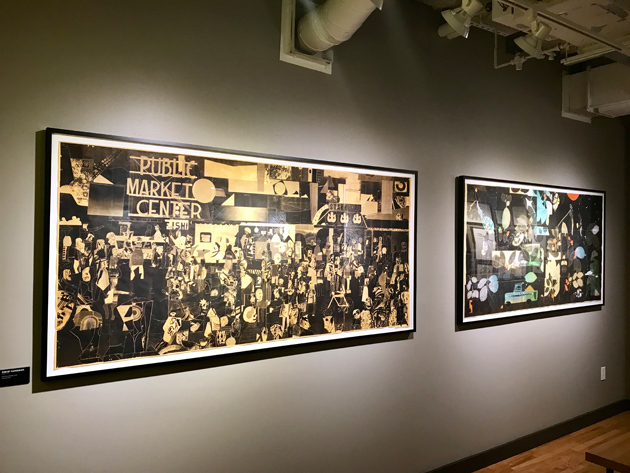 But at the headquarters in Seattle’s SoDo neighborhood, a 40 year history told through art tells Starbucks’s journey as it welcomes visitors. Out of all the wonderful artwork, one particular piece stood out. From afar, the piece looks like a basic painting of the Starbucks siren logo. But upon closer look, thousands of interlaced thumbprints appear. Sometimes art is about the impact of a piece, the memory behind it, a block of time to never be forgotten. 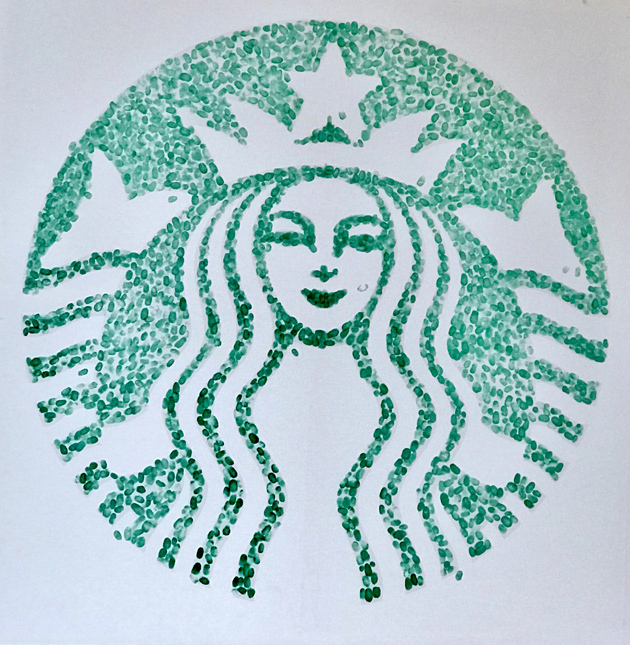 After the mission was unveiled, Starbucks employees at the headquarters were asked to symbolically buy-in by sharing their green painted thumbprint on the canvas. This memory is saved forever on the canvas. Sometimes the most simple art can have the deepest meaning. 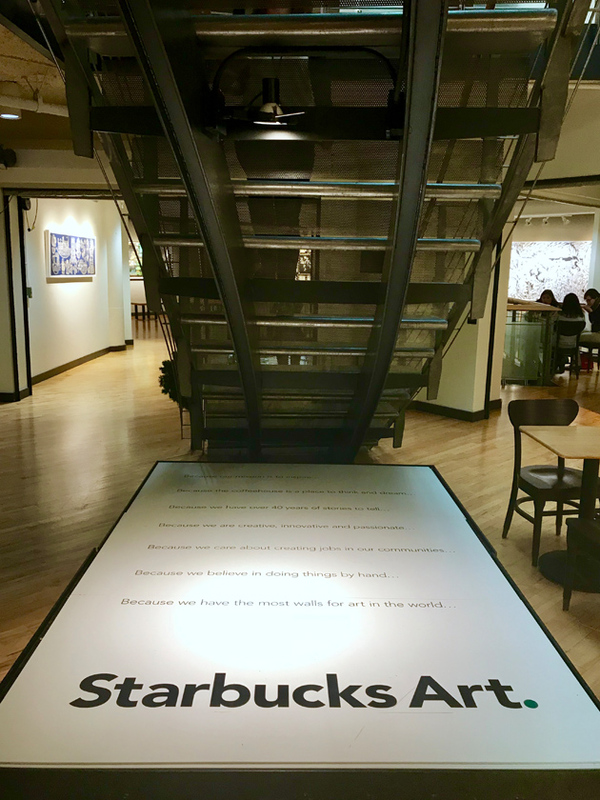 Starbucks also supports local artists at its headquarters. 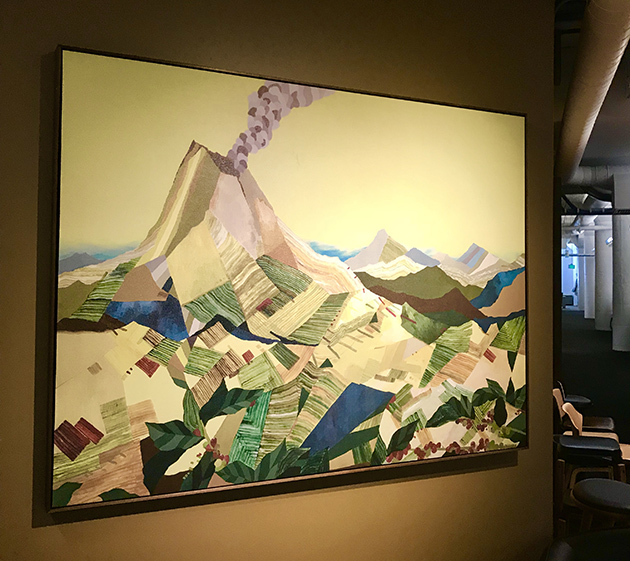 For example, adventure photographer Mike Simon’s images appear at the headquarters, including a panoramic piece in the Starbucks’ boardroom titled “Magic Carpet Ride” that captures the Starbucks Roastery. 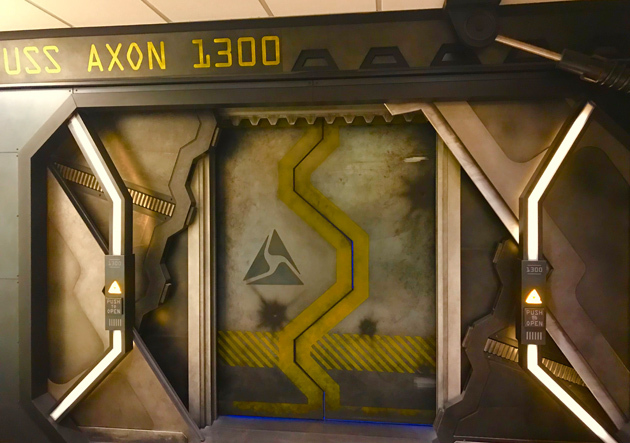 The Star Wars-themed offices at Axon grab your attention immediately as you enter the vault doors. 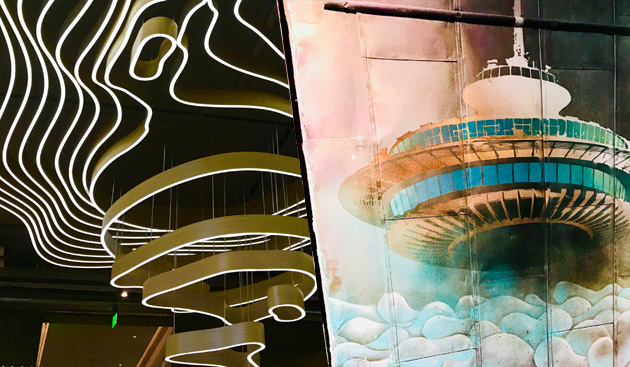 It is like you are entering a different revolutionary dimension, a futuristic galaxy of art and space. 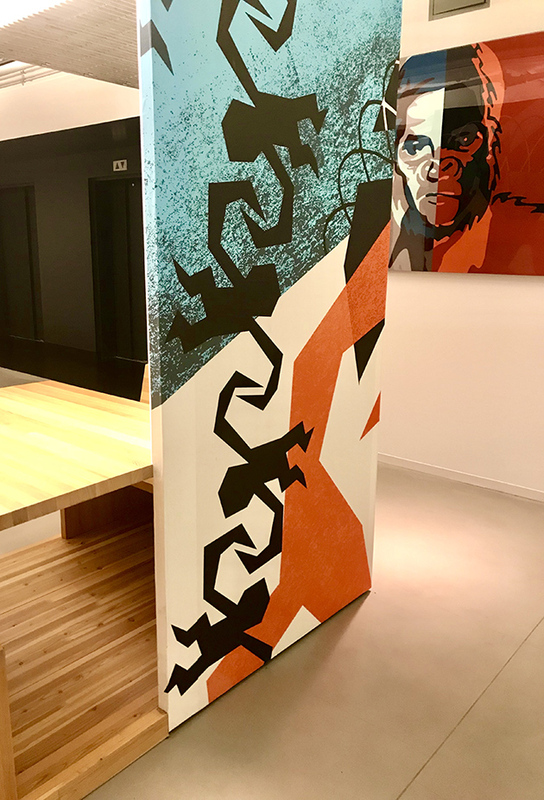 Axon, a maker of technologies used in military and law encforcement, does not express art through physical paintings, but with every integrated touch in the office design. 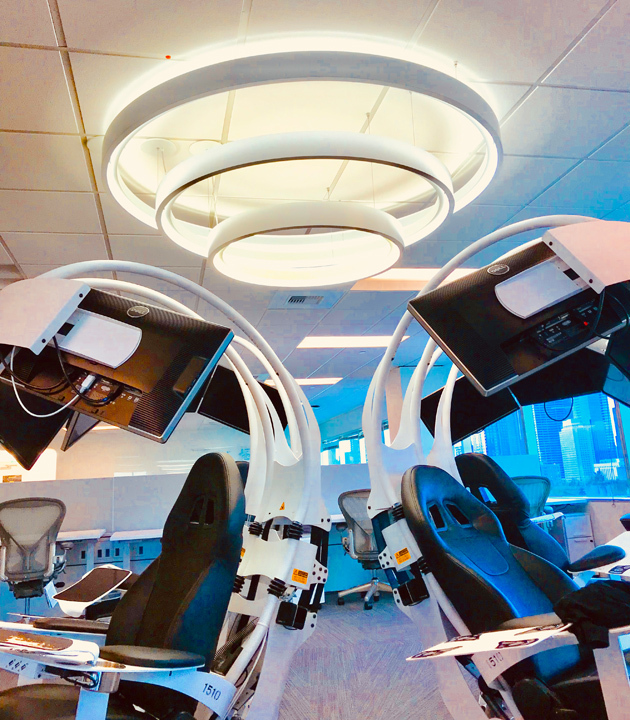 The crisp, shiny, sleek white carries throughout the entire Seattle office with hints of neon blue lights and yellow highlights that reflect off the glass and arches, creating the ambiance of a spaceship! The “Matrix Station” is a cutting edge sculptural piece of electronic art — rejuvenating your mind and transporting you to another place. 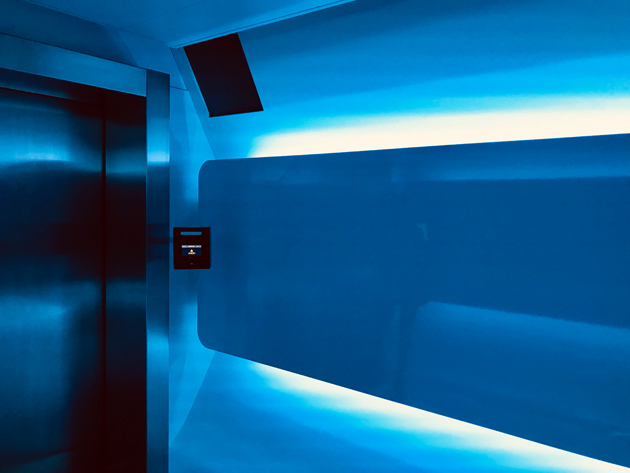 Hanging above the “Matrix Station” is an innovative sculptural, glowing light that illuminates just enough to create an atmosphere of futuristic meditation. Just like a piece of art, it gives that emotional power you feel when trying to understand a piece of art. Art encourages engagement. Art runs through the body and soul and does not always have to be visual or made of paint. Art does not have to show people what to do, when we are touched by something, we are transported to a new place that is strongly rooted to physical experience in our bodies and minds. 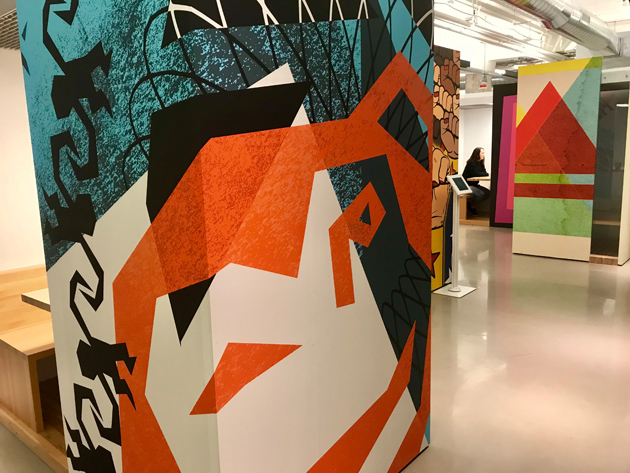 The artistic approach in Axon’s office space shows that it values creativity — encouraging employees to open minds and spark new ideas. Axon’s artistic approach is a porthole into the future of artistic technology. 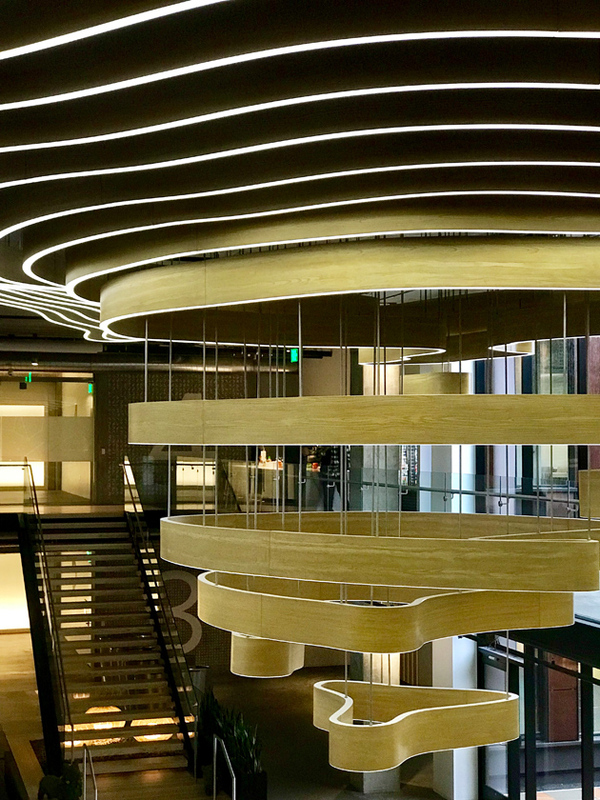 Tableau turns its new headquarters in Seattle’s Fremont neighborhood into its own modern artistic creation. The maker of data visualization software used a massive open space to showcase an artistic vision around the themes of land, water, sky and space. 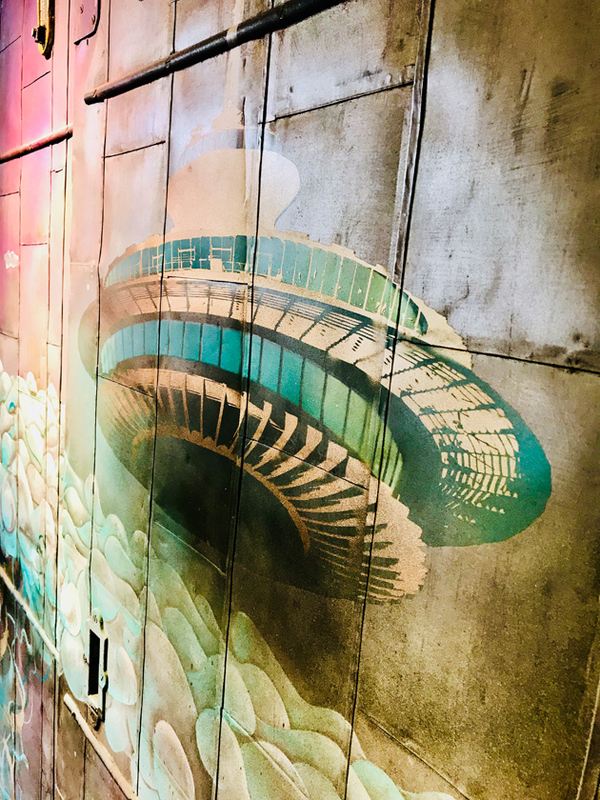 The building itself is themed into four levels which then branch off into custom rooms on each floor, like the Dark Matter Room on the Space floor. 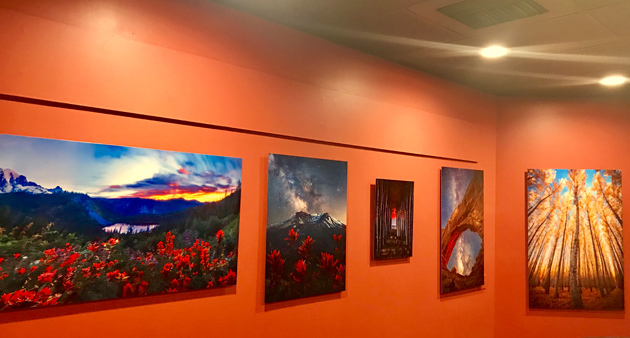 But the real eye stopper is in the lobby, with the custom made inverted depiction of Mount Rainier by Seattle based Acrylicize. Art also can serve as a rallying function. The light installation of the depiction of Mount Rainier does just that to you as you walk inside Tableau. This huge, soaring mountain of data floating in the sky is the silhouette of the reverse topography of Mount Rainier. It can be viewed from multiple perspectives. Every angle shows a different story. A sculpture like this adds an overwhelming sense of calm to the workspace. This is what makes art so special. Art is the product of the process, it is meant to influence and affect the senses, emotions, and intellect. 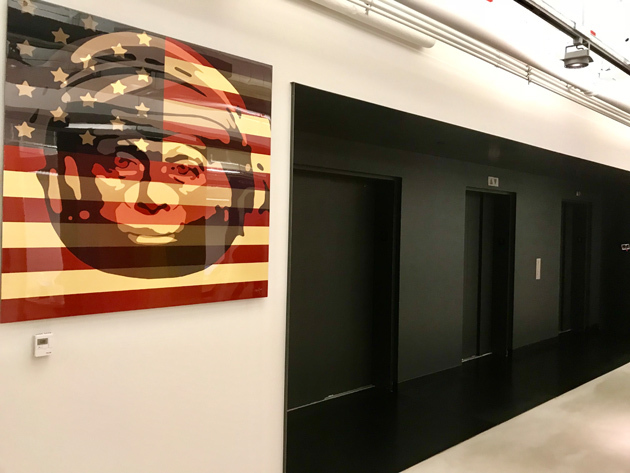 This custom piece represents the soul of Tableau’s data driven office space. This stylish mid-century modern space houses the creative minds of PicMonkey, a Seattle digital photo editor. The space embodies fun, energy and creativity. Using a whimsical monkey as its mascot of sorts, PicMonkey reflects its culture through art. The design reflects the nostalgia of growing up after World War Two, when the world needed joy. 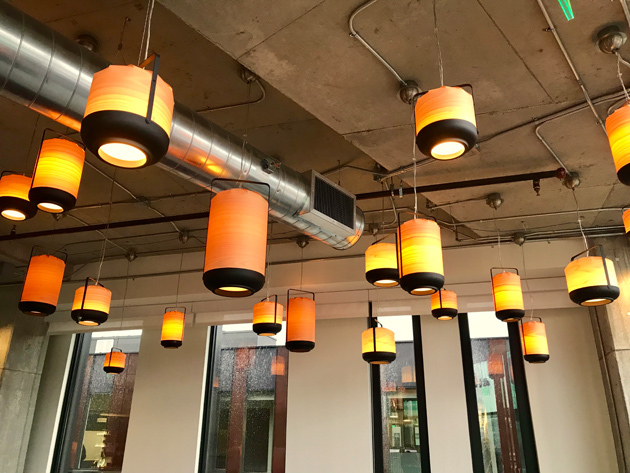 It is a “modern workspace that accommodates remote workers and a high degree of collaboration,” said PicMonkey brand director Karen Cooper. Bright colors, futuristic themes and monkey-themed pop portraits by artist Troy Gua showcase a unique environment. Pop art is probably one of the most influential societal tools of the modern and post-modern age. Art is more than aesthetic. It has a positive and powerful physiological impact on the brain. 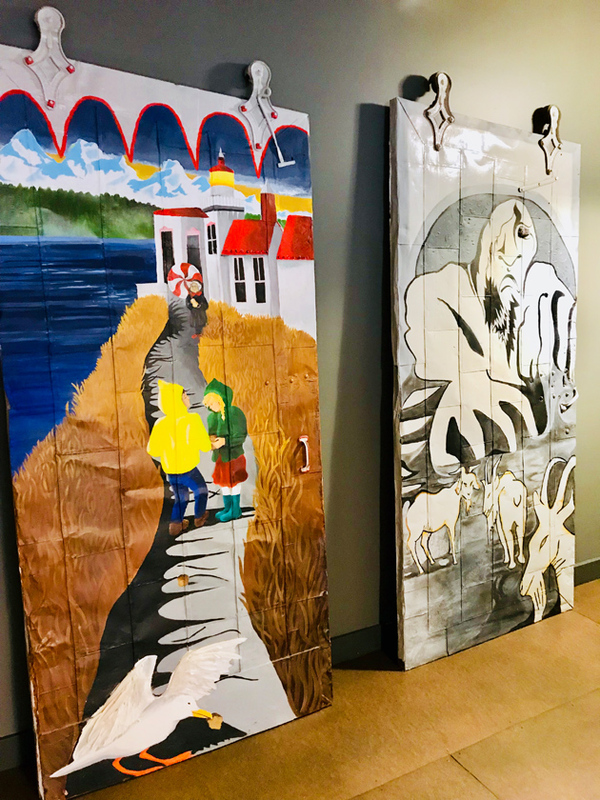 These custom paintings and pod wraps match PicMonkey’s creative vision. 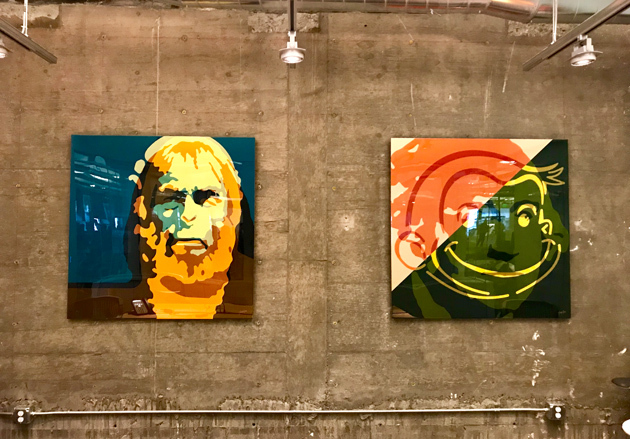 PicMonkey is literally wrapped up in the art of Seattle pop artist, Troy Gua. 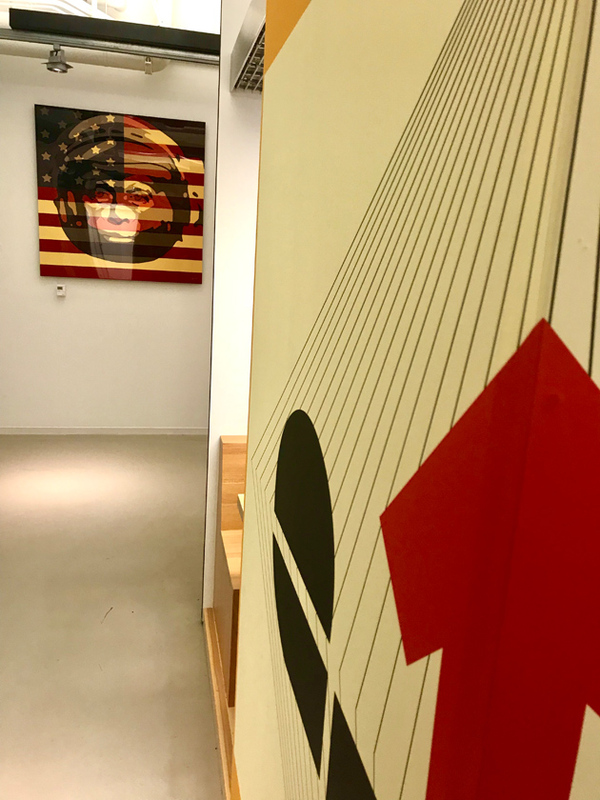 Gua’s paintings hang throughout the office and conference room, but what stood were the unique artistic work pods. They literally are brilliant, powerful, inspiring cubes of art meant to spark creativity. Gua preserved the ideas from the design team, representing the things that inspired them as kids growing up. 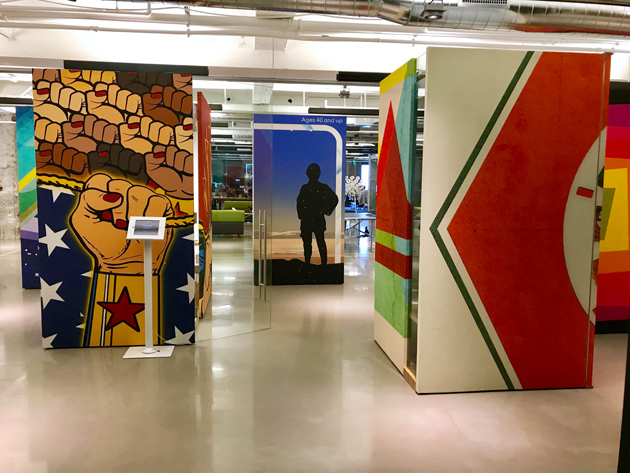 From the powerful image of Wonder Woman to the nostalgia of a Cracker Jack box, the PicMonkey allows employees to literally work inside pieces of art. Color is a huge factor in the creative atmosphere. It is a powerful tool in the space, bringing out senses and emotions. The color in the artwork draws you in. It almost becomes interactive art, meant to be used, touched and enjoyed. When you create your environment to feel like a piece of art, the emotions inside these spaces change drastically. At PicMonkey, all I could feel was this inspiring and positive work environment meant to design and dream. (Editor’s note: GeekWire chairman also serves as chairman of PicMonkey). The idea at Chef? Create a collection of Seattle Icons in a funky, fairytale themed style. Amazingly, when The Sanctuary Art Center arrived at the Chef headquarters, they realized it was their old location. The unlikely alliance represented an opportunity to share an experience between two radically different organizations. The environment in Chef is a welcoming, warm place. 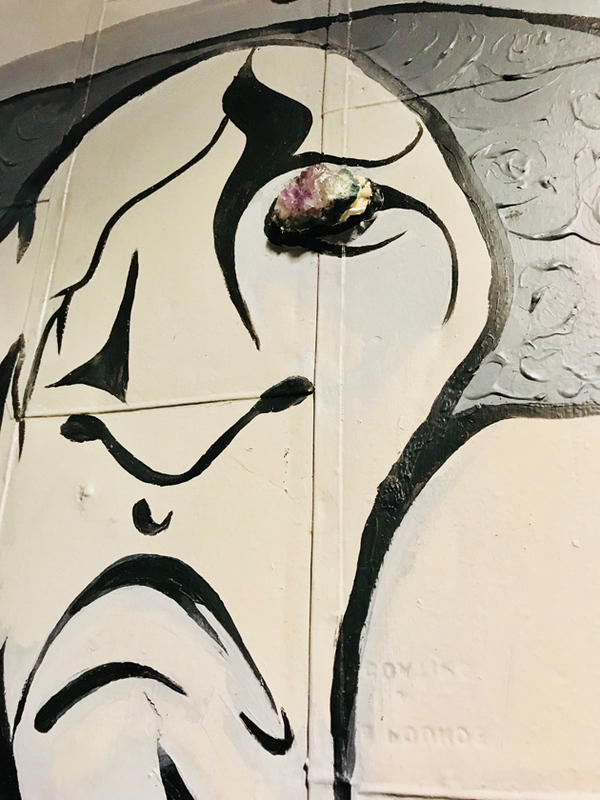 Chef brings the Seattle community and culture inside their offices, and they use art to inspire the community and reflect on what that community means. The arts have the uncanny ability to bring people together across traditional barriers such as age, income, education, race and religion. Art has the power to start conversations we might not otherwise have. Chef achieves this in their space, using the original doors from the building as a “canvas” for commissioned pieces. These were the same doors that opened and closed the Sanctuary Art Center studio doors everyday and night. 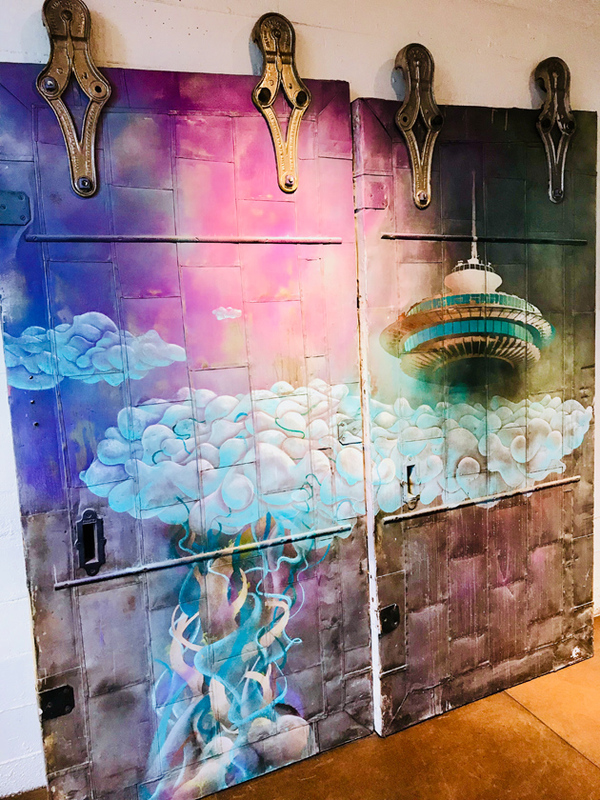 Mystical, fairytale themes mixed with recognizable Seattle spots appear on the doors, like the magical Jack and the Beanstalk Seattle Space Needle Skyline (Lance Lobuzzetta); The Three Little Pigs in Pike Place Market (Troy Carter) or The Fremont Troll with Hansel and Gretel (Rheannon Rice). 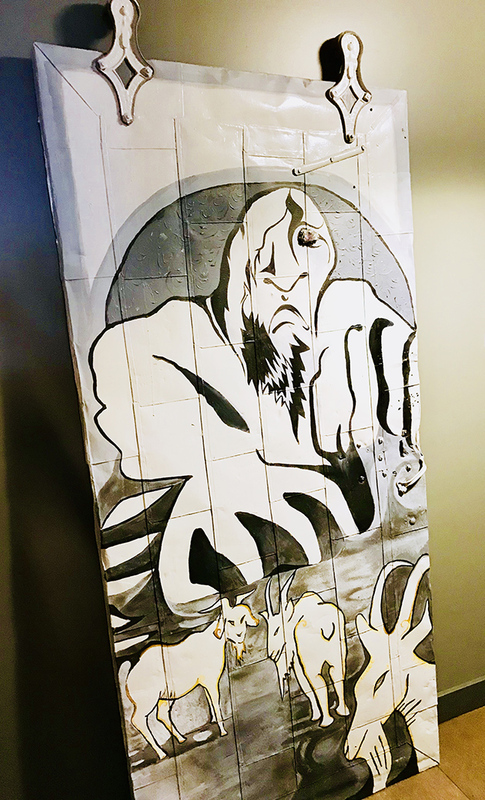 Chef preserved and enhanced their workspace with this visionary door art. 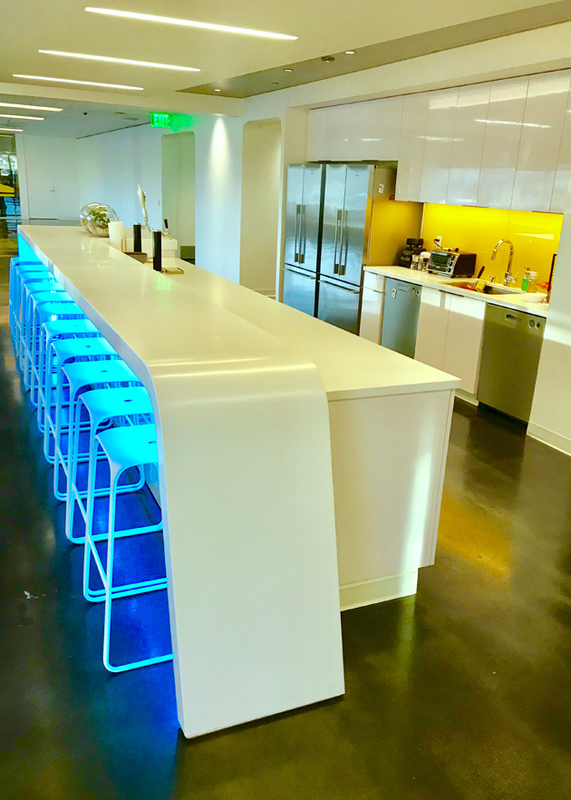 The splashes of colors and interesting rolling doors alter the mood of Chef and add a fresh twist on their office space that brings the Seattle community and culture inside the company’s walls. The choices of art pay tribute to the neighborhood’s history. Art can sometimes be a puzzle, not meant to be understood by everyone. But that is the beauty of art. It makes you think and wonder. 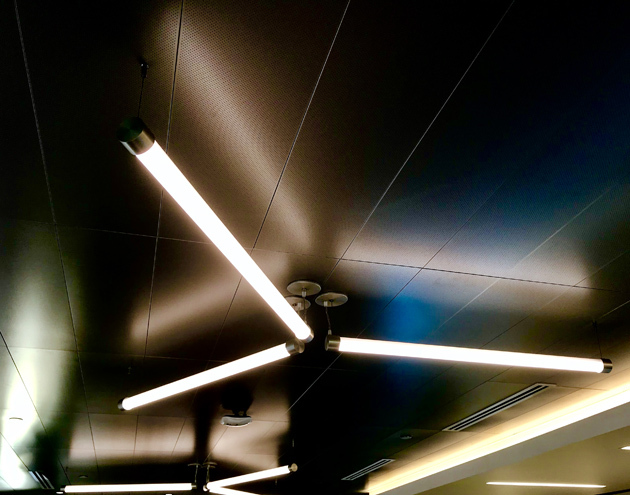 It often divides opinion, and in communal spaces such as working spaces, lounges or break rooms, it serves as a focal point. Art in this sense is communication. It allows people from different cultures and different times to communicate with each other. It gets people talking, and it opens dialogue that may have otherwise been lacking. After touring these five Seattle locations, I kept coming back to the same place. Art touches our lives — and the environment we work in — so deeply. With some of the simplest and surprising touches, art impacts our minds and souls. Aegea Barclay is a sales development executive at Seattle-based DevHub, makers of RallyMind. 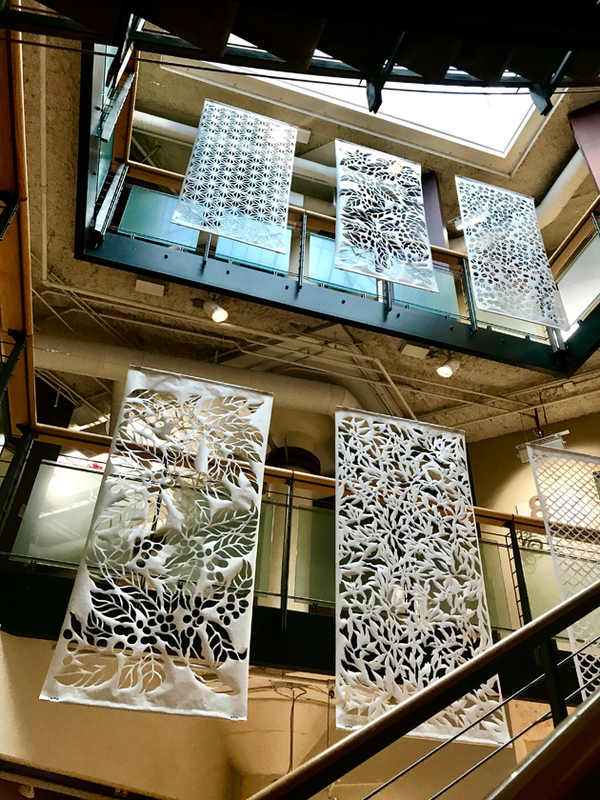 A native of the Northwest and a graduate of Cornish with a BFA, she is an abstract artist whose work has been exhibited in Foster/White Gallery, Fred Hutchinson Cancer Research Center, with notable patrons including Charlie Sheen, Flea of the Red Hot Chili Peppers, Grammy Award winner Layzie Bone and NBA player Spencer Hawes.